Spinal cord compression following thoracotomy for posterior mediastinal mass is a rare occurrence. Common causes such as hematoma, thrombosis of anterior spinal artery, and migration of hemostatic agents have been reported in literature. We report a case of posterior mediastinal mass who developed paraparesis after its excision in the postoperative period. A 28-year-old male, belonging to ASA 1 physical status, was posted for excision of posterior mediastinal mass. Chest X-ray showed a round globular mass on left side of the chest [Figure 1]a. Computed tomography scan revealed a mass of 6 × 4 cm fixed to the sixth and seventh ribs near costovertebral junction [Figure 1]b. On arrival to operation theater, all standard ASA monitors were attached and a combined spinal epidural was performed at L3–L4 level and intrathecal morphine 300 μg was given. General anesthesia was induced and maintained with desflurane in O2. Left muscle sparing thoracotomy through fifth intercostal space was performed. Tumor was found adherent to the posterior fifth, sixth, and seventh ribs. Complete removal of the mass along with partial removal of ribs was done. Surgicel was placed between transverse process. Patient was hemodynamically stable throughout and was extubated and shifted to ICU for monitoring. He was moving both lower limbs and was pain free. After 3 h, patient started complaining of band like pain in abdomen and weakness of both lower limbs, which quickly progressed to complete motor weakness of both lower limbs along with complete loss of sensations below T8 dermatome. Bilateral plantar reflexes and bowel and bladder control were absent. Neurology consultation immediately obtained. Magnetic resonance imaging (MRI) lumbosacral spine was done, which revealed fracture of D6 pedicle and spinal hematoma causing spinal cord compression [Figure 1]c. Therefore, an emergency costotransversectomy of D5, D6 along with hemilaminectomy of D6 vertebrae were done along with hematoma evacuation. Postoperatively the patient's motor power in lower limb improved gradually and patient was shifted to ward with power of 2/5 in both lower limbs. Since his motor power in lower limbs was not improving, we did MRI lumbosacral spine, which revealed myelomalacia due to spinal hematoma. Patient is presently receiving limb physiotherapy. Postthoracotomy paraplegia is rare (0.08%) but catastrophic. Perioperative management of posterior mediastinal tumor can be complicated with a rare and dreaded event, such as postthoracotomy paraplegia. Factors such as hematoma at the costovertebral angle, migration of oxidized cellulose into spinal canal, and thrombosis of anterior spinal artery can be implicated., Bleeding at the costovertebral junction is particularly notorious and difficult to control. It may require the use of surgicel, bone wax, and electrocauterization. Since spinal canal is only a few millimeters from the intrathoracic opening of the intervertebral foramen, closure of the wound with rib approximation may force surgicel or bone wax into the adjacent foramen by causing compressive forces on it. Hemostatic agents swell to form a gelatinous mass and may later migrate through intervertebral foramen into the epidural space. Such experiences ought to alert the anesthetist for the possibility of spinal cord compression, because the epidural catheter can easily be incriminated without thorough evaluation. Use of bone wax or surgicel must be brought to the knowledge of the anesthesiologist and periodic neurological examination should be carried out. There is a need for a high level of suspicion for iatrogenic spinal cord injury and strict postoperative vigilance for early diagnosis of spinal cord compression to ensure early intervention for such cases. John J, Manoj P, Nair SG, Chandrasekharan AP, Satyaprasad V. Paraplegia after thoracotomy: An unusual cause. J Cardiothor Vasc Anesth 2005;20:696-9. Brodbelt AR, Miles JB, Foy PM, Broome JC. 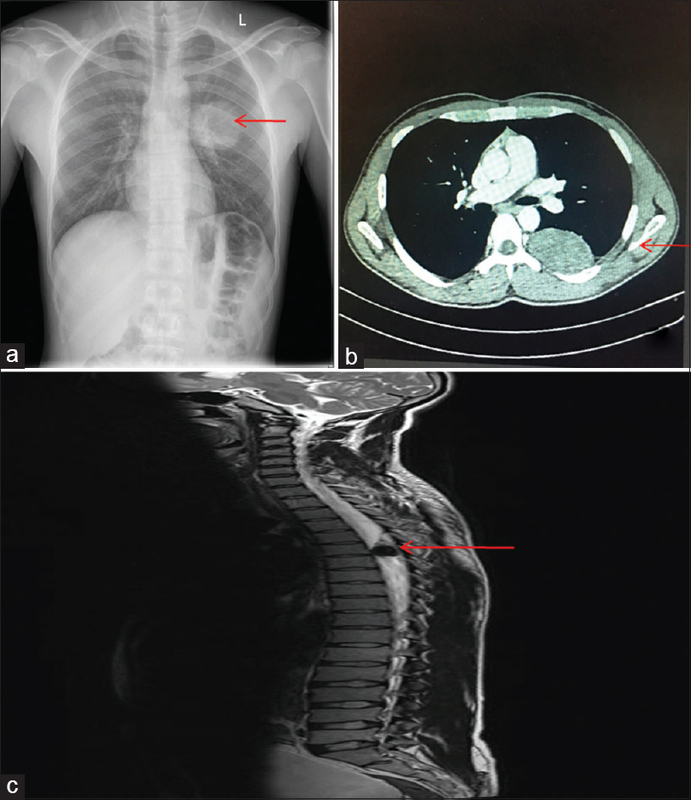 Intraspinal oxidised cellulose (Surgicel) causing delayed paraplegia after thoracotomy--a report of three cases. Ann R Coll Surg Engl 2002;84:97-9. Sohal AS, Sundaram M, Mallewa M, Tawil M, Kneen R. Anterior spinal artery syndrome in a girl with Down syndrome: Case report and literature review. J Spinal Cord Med 2009;32:349-54. Kumar A, Kale S, Dutta R, Kumar A. Post-thoracotomy paraplegia due to epidural migration of bone wax. Eur J Cardiothorac Surg 2009;35:734-6.